First dedicated on October 21, 1947, Russell Dougherty Elementary School has a long and proud heritage. The school’s namesake was a native of Edmond, Oklahoma and an Air Corps bomber pilot. He was awarded the Air Medal with three oak leaf clusters for missions in the Pacific during World War II. His unit was the 307th Bomb Group known as the “Long Rangers.” He was stationed in Guadalcanal when he and eleven crewmen crashed with a heavy bomb load in the B-24 over the Solomon Islands in April of 1943. Russell Dougherty was twenty-four years old. The school bears his name to honor the first graduate of Edmond High School to be killed during World War II. The school was dedicated to him three and a half years after his death. Construction on the school began in 1943. The school was built in several phases with the south section completed first. Kingsley School which stood on the existing playground facing Litler between Main and Hurd streets was demolished in 1946 to finish construction of the school. Some of the native red sandstone quarried from near the Dougherty farm was taken from Kingsley School to complete the construction. More than sixty years later some of the trees that lined the grounds of Kingsley School remain on the playground as reminders of our heritage. Russell Dougherty School served as a junior high until 1957 and then as an elementary school for the neighborhood children until its doors closed on May 25, 1991 for extensive remodeling. In August of 1992, forty-five years after its doors were first opened Russell Dougherty Elementary School opened its doors again to provide quality education as Edmond Public School’s first Parent Choice School for Kindergarten through fifth grade. The school would have no attendance boundaries and the emphasis would be on Spanish instruction for all students and the use of technology in the classrooms. Parents eagerly camped out overnight to assure their child a place at Russell Dougherty. This system was changed for the 2000-2001 school year as a lottery system was used to determine student placement. In 2002 a Media Center and conference room were added to the north end of the school after an extensive search for man-made stone was found that could seemlessly connect the addition to the original stone of the building. 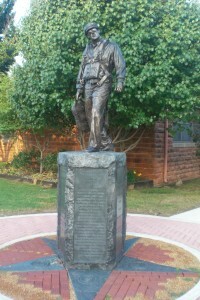 The summer of 2009 brought the dedication of a statue of Russell Dougherty to the southeast corner of the school which honors all who serve in the military in our county. In 2009 construction began on the school’s second addition to the south end of the building which will become the home to two early childhood rooms and music room. Each year, former students young and old stop by to reminisce about their time at Russell Dougherty Elementary and share memories with the staff. We believe Russell Dougherty would be proud of his namesake at 19 North Boulevard in Edmond, Oklahoma. Russell Dougherty was on the high school wrestling team and built furniture in his high school shop class. But he is perhaps best known for being a prankster. He and a friend would go to Oklahoma City and stand on a street corner and look up as if they were observing something on a roof top. Inevitably other people would stop and look up…at nothing. Sometimes they’d get a pretty good crowd all looking up together. Russell Dougherty is the home of the Russell Dougherty Eagles. 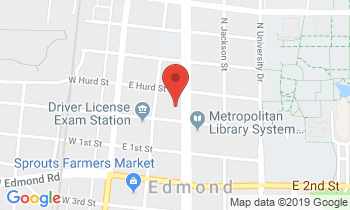 The school is located in the heart of historic downtown Edmond, Oklahoma between Boulevard and Litler to the east and west and Hurd and Main to the north and South.We are a school with an Open Enrollment to any Kindergarten through fifth grade child in the Edmond Public Schools district. Parents may submit an application for the child to attend with classroom spaces filled based upon a lottery system. Parents must provide transportation to and from school. Russell Dougherty was chosen to be one of Oklahoma’s first A+ schools. National honors were also bestowed upon Russell Dougherty in 2004 with the United States Department of Education identifying the school as a 2004 NCLB (No Child Left Behind) Blue Ribbon School.